There are many types of NH car crashes and many reasons why they happen. There can be several factors in one single crash, and having an experienced, car accident attorney by your side to help maneuver the legalities after any crash is important. Car accidents can occur in the day, at night, first thing in the morning, or at high noon. Where the sun is in the sky can play a role in the crash. The road conditions can also lead to a crash – were they wet, dry, icy, or under construction. And what the other driver was doing at the time of the crash can also be important – was he texting or talking on the phone, was he adjusting the radio or air conditioning, was he falling asleep or was he drunk. A head-on collision occurs when the front end of two cars hit each other. A head-on collision is defined as a “roadway departure,” because the vehicle has not stayed centered in its lane and either leaves the roadway or crosses the centerline. 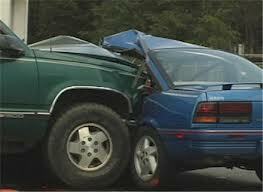 In 2012, head-on collisions accounted for more than three-quarters of all traffic fatalities in New Hampshire. A head-on crash can also happen when a car enters a highway on an off ramp and drives the wrong direction. Rear-end crashes often happen when one driver is following too closely behind another vehicle. Not leaving enough space to stop can lead to the front end of one car hitting the back end of another. In driver’s education class you may have learned the three-second rule. That is select a stationary item on the side of the road – often this is a mile marker or tree. When the backend of the car ahead of you passes this marker start counting. If you get to the marker before you get to three seconds, you’re likely following too closely. If that driver suddenly stops, you could end up rear-ending him. A vehicle will end up on its side or roof in a rollover accident. A rollover can happen in many situations from turning a corner too quickly and hitting a curb, to losing control on an icy highway. It is important to be wearing a seatbelt any time you are traveling in a vehicle, but in a rollover crash it can be critical and could mean the difference between life and death. When one car hits the side of another car it is called a side-impact crash. It is often also referred to being “t-boned” or “broadsided.” This type of accident often happens at intersections, and depending on the severity of the collision one or both cars may spin away from the original collision hitting other cars or even people. Side-impact accidents often happen when one driver fails to yield to another driver. The driver may run a red light or stop sign, or it may happen when one car is backing up in a parking lot. This type of crash can be one of the most dangerous depending where on the car the impact occurs. Although side impact air bags are becoming more common in vehicles, there is little to cushion the blow of one vehicle slamming into the side of another. If you have been injured in an automobile accident in New Hampshire, call the car accident lawyers at Tenn And Tenn, P.A. We will provide you a free and confidential consultation of your claim – 1.888.511.1010.